No visit to Bath is complete without tasting the Spa water. It bubbles up to a fountain in the Pump Room and a glassful of the famous healing water – served when still warm – will cost you very little. Be warned, though, it does taste more than a little peculiar. 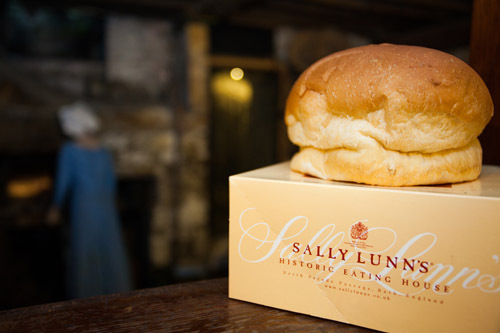 The idea for the famous Bath Bun was first cooked up in Sally Lunn’s house in North Parade Passage, possibly the oldest house in Bath. The house is both a café and mini museum. Bath Oliver biscuits, on the other hand, are available in just about any supermarket these days. The Fine Cheese Shop on Walcot Street and Paxton & Whitfield on John Street sell local cheeses, including the very popular Bath Soft Cheese. Don’t miss the Fish Market on Green Street and the Sausage Shop next door. The Guildhall Market is also a good source of local produce, while you can visit the Bell pub on Walcot Street for Abbey Ales beer. Whatever you do, don’t miss Farmers Market at Green Park Station. Everything is produced locally and there is a mouthwatering selection of seasonal fruit and vegetables, baked goods, cheese, meat, fish, juices and more. Plus you get to meet the producers themselves.